Join in and write your own page! It's easy to do. How? Simply click here to return to Greatland Tents Discussion. I have had my tent 3 or 4 yrs, it has a screened in porch and is plenty big enough for me, the only problem is the poles with the elastic breaking but now I have a new web site to go to maybe I can get parts now. LOST THE INSTRUCTIONS, CAN'T GET THE POLES TO LOCK, AND THE SHAPE TO FORM A DOME. IT HAS 2 SIDE ROOMS. ANY SUGGESTIONS? I have a greatland Insta-set tent and the easy way to lock the poles is to have someone go inside after you spread it out on the ground and hold up the center. My teenage daughter does this while I then push the joint that locks each pole down and into place. Having someone inside makes it very easy to do. One minute set up for us! I believe this is the tent, but it could be a newer model. I bought a great 2-3 man great land dome tent and it is a great backpacking tent. It has a great design for the sort of built in ground cloth. It is simply a tarp at the bottom and gets rid of needing to carry one with me. However, it doesn't have a vestibule and that is a necessity for winter backpacking. If any one can help, just leave a comment and a link on the page. The tent you have shown is considered a 3 season tent. 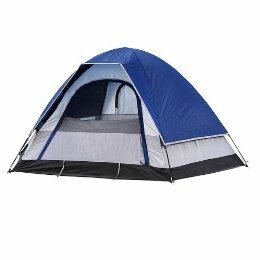 For winter camping and hiking a 4 season tent works better, and many do have vestibules. They are a little more expensive than the 3 season tents, but they are made to stand up to snow, don't have as many windows and are less ventilated in order to keep the cold out.